More than 200 riders are expected to turn out for a Los Angeles poker run raising money for Miriam's House, a sober living environment for pregnant, single mothers and their kids. 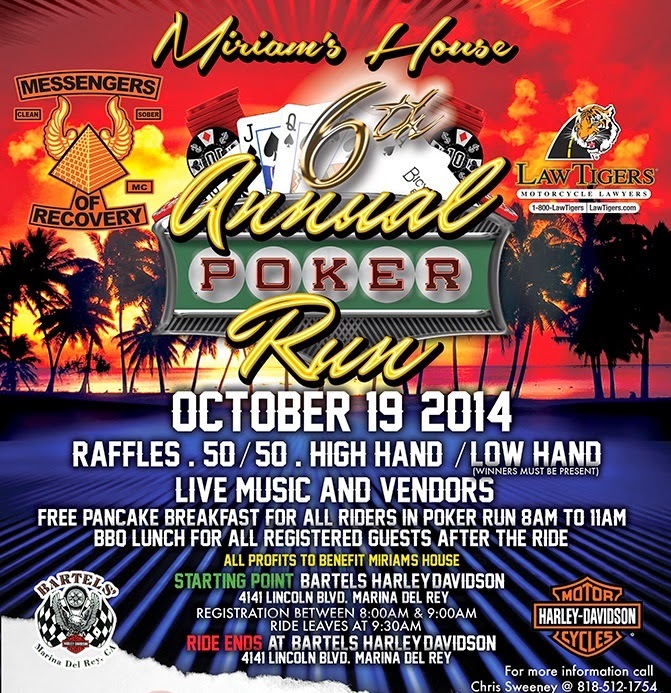 Miriam's House Poker Run, which takes place on October 16, 2014, is in its sixth year and will feature celebrity appearances, live music from Mercy and the Machine, dozens of vendors, a raffle and a silent auction. "The event has grown over the last six years with the help of all its sponsors and the generous hearts of the motorcycle community," said Marc Heathfield of Messengers of Recovery, one of the event's sponsors. "The turnout has been overwhelming." Other sponsors include Law Tigers, the Promises Foundation and Bartels Harley-Davidson, which is hosting the poker run. Owner Bill Bartels says he is eager to see a big turnout. "All riders are welcome to participate in the ride. All non-riders, friends, and supporters are welcome to join the event," he said. "This is such a worthwhile cause." Miriam's House is a project started by the Promises Foundation, and provides a transitional home for women and their children, delivering a one-year program of recovery services, parenting education, career guidance, scholarships and a pathway to permanent housing. "The families from Miriam's House are so grateful for all the support from the biker community and Bartels Harley Davidson. I look forward to another amazing and safe ride," said Promises Foundation board member Bryan Moeller. The Miriam's House Poker Run kicks off at noon from Bartles Harley-Davidson: 4141 Lincoln Blvd, Marina Del Rey, Calif.
To learn more about the run and the cause it supports, visit the Promises Foundation website.